In a saucepan combine the cocoa, sugar and salt and stir to blend out lumps. Slowly add the hot water to create a chocolate-like syrup, stirring as it comes to a boil, then simmer for 2 minutes over low heat, add 1/2 teaspoon vanilla. Warm 2 cups milk and 1 cup light cream in a separate pan (or microwave) and add it to the chocolate mixture, heating it all to a simmer. Note that heating milk in this manner forms a skin that you might like to remove. The best way to do this is to strain the hot cocoa before serving or use a spoon to skim it off. 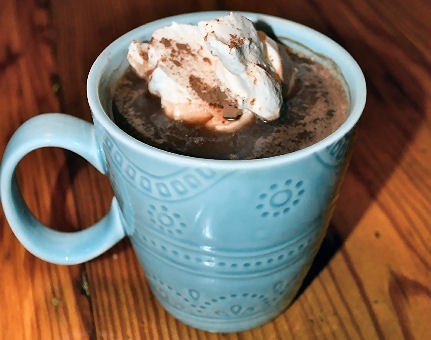 Serve in warmed mugs and top with whipped cream and a dusting of cocoa powder!